Kyle King has your stat of the day. Look at the bright side, the Dawgs are 5-1 vs. the defending national champs over the past 43 years. DawgSports.com has the details. 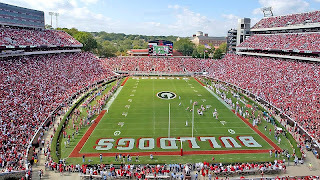 Oh...and the last time the Georgia Bulldogs lost to Kentucky, beat Auburn, beat Georgia Tech and the Gators won the National Title all in the same season, we went on to have our best season in 14 years ('84-97) the very next year. So there's that.